Go to original pattern for design DROPS 194-13. 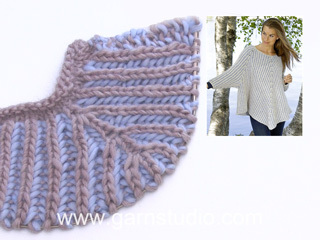 Knitted poncho jumper with raglan in DROPS Air. The piece is worked top down with English rib in two colours. Sizes S - XXXL. 12 stitches in width and 16 rows in height (seen from the right side, i.e. a total of 32 rows) of English rib = 10 x 10 cm. DROPS DOUBLE POINTED NEEDLES AND CIRCULAR NEEDLE SIZE 7 MM: length 40 cm and 80 cm for English rib. DROPS DOUBLE POINTED NEEDLES AND CIRCULAR NEEDLE SIZE 6 MM: length 40 cm for edges. 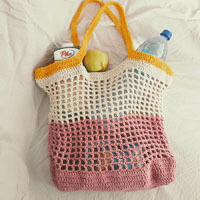 You can get the yarn to make this pattern from	36.80£. Read more. ROUND 1: Worked with colour wheat. Work * 1 yarn over, slip 1 stitch as if to purl, knit 1*, work from *-*. ROUND 2: Worked with colour fog. * Purl the yarn over and the slipped stitch together, 1 yarn over, slip 1 stitch as if to purl *, work from *-* (be careful; the last yarn over does not look like a yarn over, but the wheat strand is at the front of the piece, lay the strand over so that it becomes a yarn over) - read KNITTING TIP. ROUND 3: Worked with colour wheat. Work * 1 yarn over, slip 1 stitch as if to purl, knit together the yarn over and the slipped stitch *, work from *-* (be careful; the last yarn over does not look like a yarn over, but the fog strand is at the front of the piece, lay the strand over so that it becomes a yarn over). 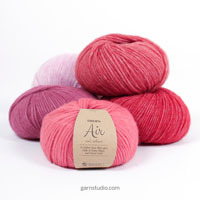 If you are in doubt as to which colour to use on the next round, you can always see which colour the previous round was worked with by the colour of the yarn overs. To work out how to increase evenly, count the total number of stitches on the needle (e.g. 68 stitches) and divide by the number of increases to be made (e.g. 4) = 17. 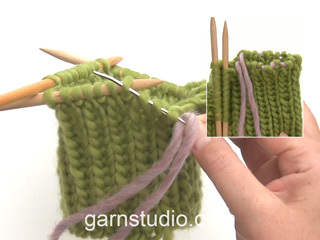 In this example, increase by making 1 yarn over after each 17th stitch. On the next round knit the yarn overs twisted to avoid holes. All increases are made on 1 round with wheat. Work 5 stitches in the stitch and the yarn over as follows: * Knit the yarn over and stitch together, but wait with slipping the stitch and yarn over off the needle, make 1 yarn over the right needle *, work from *-* a total of 2 times and knit together the stitch and yarn over 1 more time = 5 stitches (= 4 stitches increased). On the next round work the increased stitches into the English rib. NOTE: work each increased stitch individually (do not work yarn over and stitch together). All decreases are made on 1 round of wheat. Decrease as follows: Work until there are 3 stitches left before the marker thread (without the yarn overs, the yarn overs between the stitches are also slipped), slip the next 3 stitches to right needle as if to knit together: Slip 1 knit stitch + 1 purl stitch + 1 knit stitch (= stitch with marker) = 3 stitches without the yarn overs. Then knit together: 1 purl stitch and 1 knit stitch (= 2 stitches). Now pass the 3 slipped stitches over the stitches that was knitted together (= 4 stitches decreased – not counting the yarn overs). The piece is worked in the round with circular needle, top down. First work the yoke, where you increase stitches for sleeves and body. 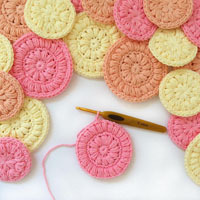 Then divide the piece; the body is continued in the round with circular needle and the sleeves are worked in the round with short circular needle/double pointed needles. The round starts in the transition between 1 sleeve and the back piece. Cast on 68-72-76-80-84-88 stitches with circular needle size 6 mm and wheat. Knit 1 round. 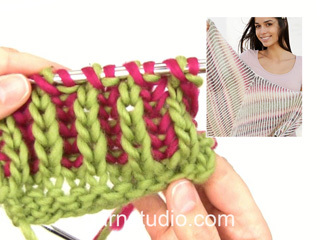 Knit 1 round and increase 4-0-4-0-4-0 stitches evenly on round – read INCREASE TIP-1. Knit 1 round. Change to circular needle size 7 mm. Then work ENGLISH RIB IN 2 COLOURS (in the round) – read description above. Insert 6 markers in the piece as follows (all the markers are inserted in a knitted stitch of wheat): Back piece: Work 13-13-15-15-17-17 stitches, work 1 stitch and insert marker 1 in this stitch (= mid back), work 13-13-15-15-17-17 stitches. Right sleeve: Work 1 stitch and insert marker 2 in this stitch, work 7 stitches, work 1 stitch and insert marker 3 in this stitch. Front piece: Work 13-13-15-15-17-17 stitches, work 1 stitch and insert marker 4 in this stitch (= mid front), work 13-13-15-15-17-17 stitches. Left sleeve: Work 1 stitch and insert marker 5 in this stitch, work 7 stitches, work 1 stitch and insert marker 6 in this stitch. Work 1 round with fog (= 2nd round of English rib). On the next round (= 3rd round of English rib) increase 4 stitches in each stitch with a marker (= knitted stitch of wheat) – read INCREASE TIP-2 above. REMEMBER THE KNITTING TENSION! Repeat this increase every 6th round of wheat (i.e. every 12th round) to finished length. When the piece measures 31-33-34-36-38-40 cm from the cast-on edge (you have now increased approx. 8-9-9-10-10-11 times) there are approx. 91-99-103-111-115-123 stitches on the front/back pieces (i.e. the stitches between markers 3 and 5 = front piece and the stitches between markers 6 and 2 = back piece) and approx. 41-45-45-49-49-53 stitches on each sleeve (including the stitches with the markers) = a total of 264-288-296-320-328-352 stitches. Right sleeve: Place the stitches between markers 2 and 3 (including the stitches with these markers) on a thread for sleeve (= approx. 41-45-45-49-49-53 stitches) and cast on 7 stitches under the sleeve. Front piece: Work English rib as before as far as the stitch marker 5 (= approx. 91-99-103-111-115-123 stitches). Left sleeve: Place the stitches between markers 5 and 6 (including the stitches with these markers) on a thread for sleeve (= approx. 41-45-45-49-49-53 stitches and cast on 7 stitches under the sleeve. Back piece: Work English rib as before to end of round (= approx. 91-99-103-111-115-123 stitches). Continue in the round with English rib and increase 4 stitches in the stitches with marker 1 and marker 4 (= mid front/back) every 6th round with wheat as before (i.e. every 12th round). In other words, increase 8 stitches each 6th round with wheat. 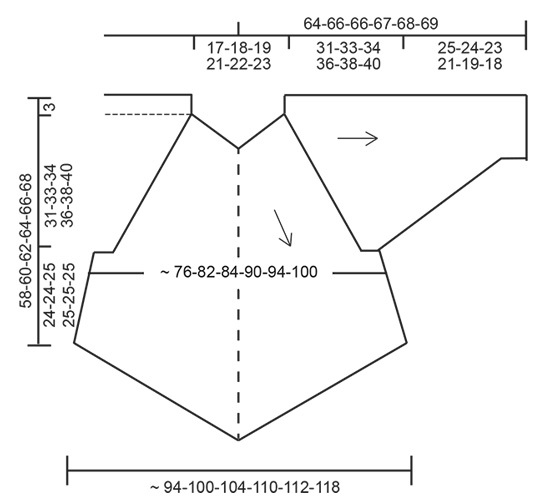 Continue like this until the piece measures 24-24-25-25-25-25 cm from where the body was divided from the sleeves = approx. 244-260-268-284-292-308 stitches (after 6 increases on the body). Adjust so that the next round is a round with wheat. Cast off with knit over knit and purl over purl; the yarn overs are cast off as normal stitches with knit. This is to avoid the cast-off edge being tight. Place the stitches from the thread on the one side of the piece on short circular needle size 7 mm (= approx. 41-45-45-49-49-53 stitches) and knit up 1 stitch in each of the 7 stitches cast on under the sleeve = approx. 48-52-52-56-56-60 stitches. Insert 1 marker in the knitted stitch mid under sleeve. Continue in the round with English rib. Change to double pointed needles when necessary. 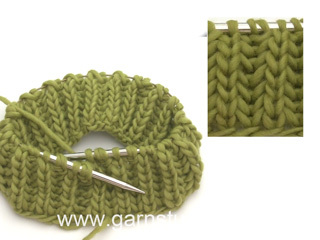 When the sleeve measures 2 cm from where it was divided from the body, decrease 4 stitches in the stitch with the marker (= knitted stitch) – read DECREASE TIP. Decrease like this every 4½-3½-4½-3-3½-2½ cm a total of 5-6-5-6-5-6 times = 28-28-32-32-36-36 stitches. Continue in the round with English rib until the sleeve measures 25-24-23-21-19-18 cm from where it was divided from the body; adjust so that the next round will be worked with wheat. Change to double pointed needles size 6 mm. Knit 1 round with wheat, the yarn overs are knitted together with the purled stitches. Then cast off with knit; make sure the cast-off edge is not tight. You can cast off with a size larger needle if this is a problem. Når jeg følger jeres video om udtagning, får jeg på omgangen efter udtagning for mange masker på pinden. Iflg video strikkes der slå om, løs af, en vrang, slå om løs af, en vrang, slå om løs af. Det giver tre ekstra masker seks gange, altså atten masker for meget? Hej Birgit, du har 2 nye masker på hver side af midterste maske. De 2 nye masker danner en ny patentmaske på hver side af den du udgik fra. God fornøjelse! Jättebra videounstruktion om ökning! Finns det en med minskningsstickning också? Hei Kinga. På omgang 2 strikkes kastene sammen med den masken som ble tatt løst av, de er derfor ikke økninger. Her er en video av hvordan å strikke patent med 2 farger. God fornøyelse. Hei. Når jeg har økt 4 m i en maske, blir det 5 m totalt. Når jeg fortsetter på pinnen sier mønsteret at jeg skal lage 1 kast, 1 m løs av, og 2 sammen. På neste omgang får jeg da 1 m for mye når jeg skal strikke disse m inn i patenten. Hva gjør jeg feil? Hej Anne, se her hvordan du gør: öka i patent God fornøjelse! I am really struggling with the tension. On round 3 of Fisherman’s Rib, the stitches are really tight when you knit the slipped stitch with the stitch together. Also the increase is very very tight making 5 stitches. On the next round it doesn’t seem to work making the 5 new stitches part of the Fisherman s Rib. Do you have photos or a video to show how this works? Dear Mrs Bishop, try to not tighten too much the yarn when increasing - on next row continue fisherman's rib over these 5 sts, slip 1 st as if to P with a YO as before and P the next st (instead of P tog the st with YO). Happy knitting! Liebes Team, Ich habe die Übersetzung der neuen Kollektion täglich verfolgt. Es gab ein Tuch in der gleichen Farb-, Wollauswahl und Muster wie dieser Pullover. Das habe ich aber bis jetzt auch noch nicht gefunden, wie einige andere auch. Werden diese später übersetzt? Liebe Birgit, alle Modellen der neuen Kollektion werden nach und nach in den nächsten Wochen/Monaten hochgeladen. Bleiben Sie daran!